It was on a trip to Walt Disney World back in 1973 that a young college kid named Stephen Ison saw his first piece of animation art. Decades later, he would become the owner of the largest collection on the planet of original animation art from Walt Disney's Snow White and the Seven Dwarfs. 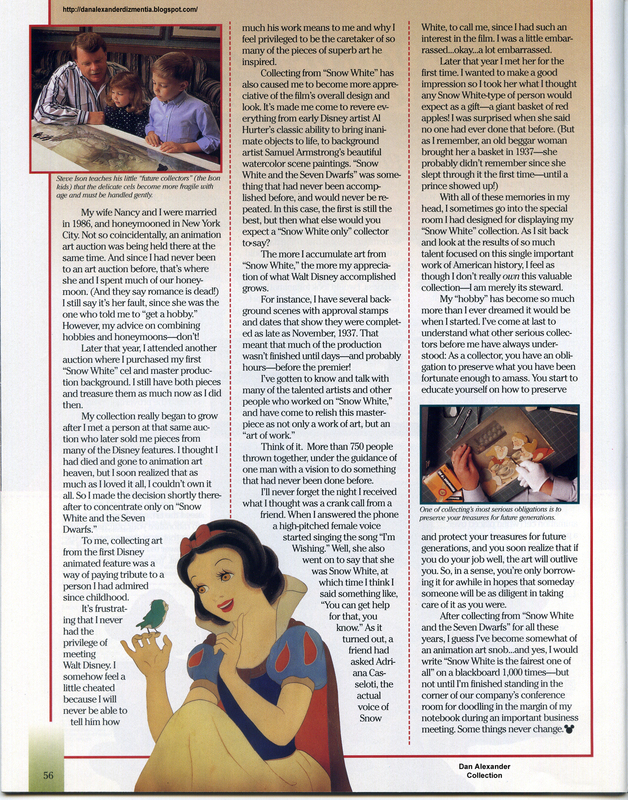 In 1994, Steve's passion would give rise to Snow White...An Art in Its Making, both a museum exhibit and a hardcover book which featured his collection. In the Fall 1993 issue of Disney News magazine (p. 55-56) an article appeared entitled A Suitor for Snow White or... Memoirs of a Devoted Collector. It was written by and about Steve and his "hobby". A Suitor for Snow White... Magazine image scans courtesy of the Dan Alexander Collection. See his blog at Dan Alexander Dizmentia. Filmic Light: Who are you Steve and how did you come to be a collector of animation art? Stephen Ison: Like most kids growing up in the 50s, I watched The Mickey Mouse Club and was always fascinated by Roy Williams (The Big Mouseketeer) whenever he would draw the various characters on the show. That’s what got me interested in drawing and my earliest exposure to all things Disney. As a kid, I was also bitten by the collector bug...baseball cards, stamps, coins, and other assorted “stuff”. I’ve always been a collector of something. I saw my first piece of animation art in 1973 at Walt Disney World and was shocked that you could actually own a piece of art used in a Disney film! Well, the price of the cel was the same as my monthly car payment...so, as a poor college kid, I had to pass, but that’s what planted the seed. I knew someday, if I ever could afford it, I’d start a collection of Disney animation art. It really was that simple. Many years later...after attending an auction of Disney animation art in New York, I started down a road to what would become more than just a hobby. FL: How did you find this animation art? And where/who did get it from? 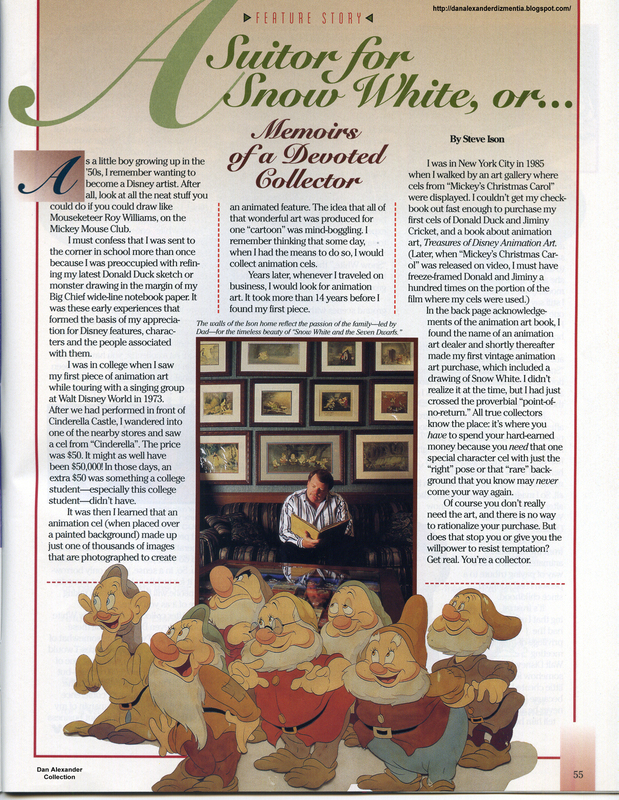 SI: When I first started, I found art in the usual places...auctions, antique toy shows, and Disneyana conventions. Later, I became as interested in meeting and knowing many of the artists who worked on the classic Disney films as collecting myself. That’s what kept me motivated to learn more and acquire (preserve) more vintage pieces. Many of my pieces came from the artists themselves. FL: Why Snow White and the Seven Dwarfs? SI: When you have the “collector bug”, you have a tendency to “want it all”, so to speak. Well, animation art began to get popular, that I felt I had to make a compromise. Which film was my favorite in style and quality? Which one was the first? Which one did Walt Disney put his heart and soul into? Snow White. 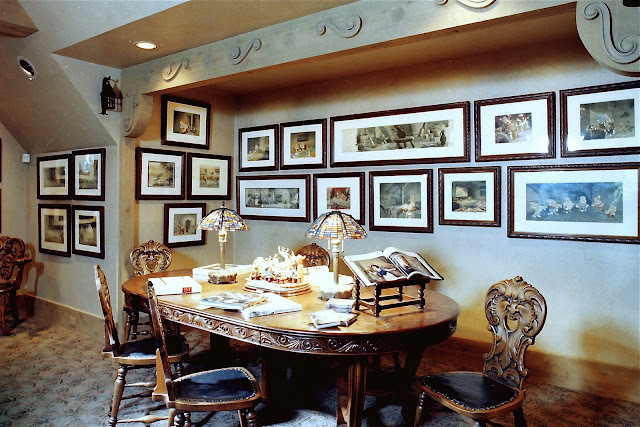 FL: What did the collection consist of, how large, what forms of art, favorite pieces? SI: By the time I had been collecting only from Snow White, I believe I had around 700 plus pieces. Those pieces consisted of master backgrounds, concept art, cels, drawings, studio notes, character models, and various other items associated with the film. 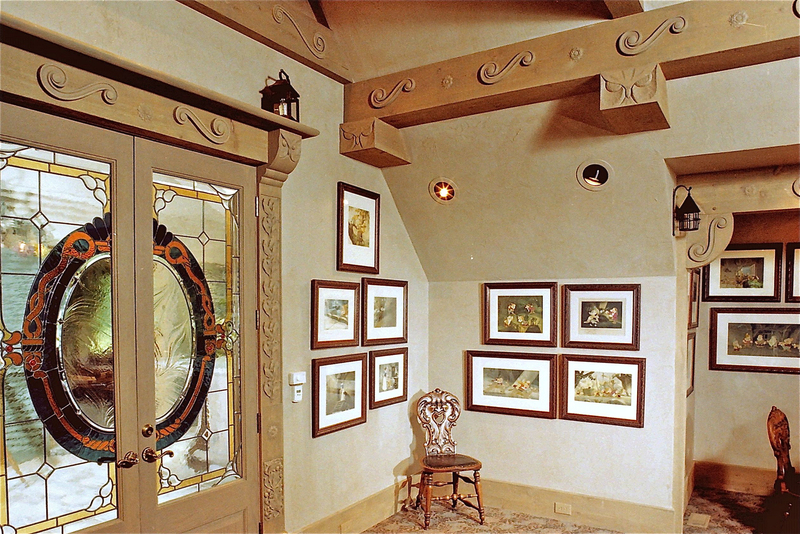 My favorite piece...that’s a hard one...guess it would have to be a panorama master watercolor background of the exterior of the Dwarfs cottage by Sam Armstrong. The Disney Art program ended up creating a limited edition of the piece. FL: Since most drawings, paintings and cels from Snow White were not signed, did you know who the actual artists were for your pieces? SI: I was always able to identify most of the drawings, concept art, and backgrounds since I got to know most of the artists who were still around while I was seriously collecting. I don’t think any of them are around anymore. It was an honor and a privilege to know many of them and be able to call them “friend”. I’d have to say one of my best friends in world was Maurice Noble; a background painter on Snow White, who later worked at Warner Brothers with Chuck Jones on hundreds of the classic shorts in the late 40s and 50s. He was one of the most talented and creative people I’ve ever know. He taught me about the classic animation process. I miss him. FL: How did you house your collection and where is it today? SI: As my collection grew, I had to learn how to preserve the art. I consulted with the Indianapolis Museum of Art about preservation and conservation, and designed a home gallery that was built to actual museum specs...and, OK...I understand this is a bit much...but, it was designed to look like the interior of the Dwarfs cottage! Yeah, I know... 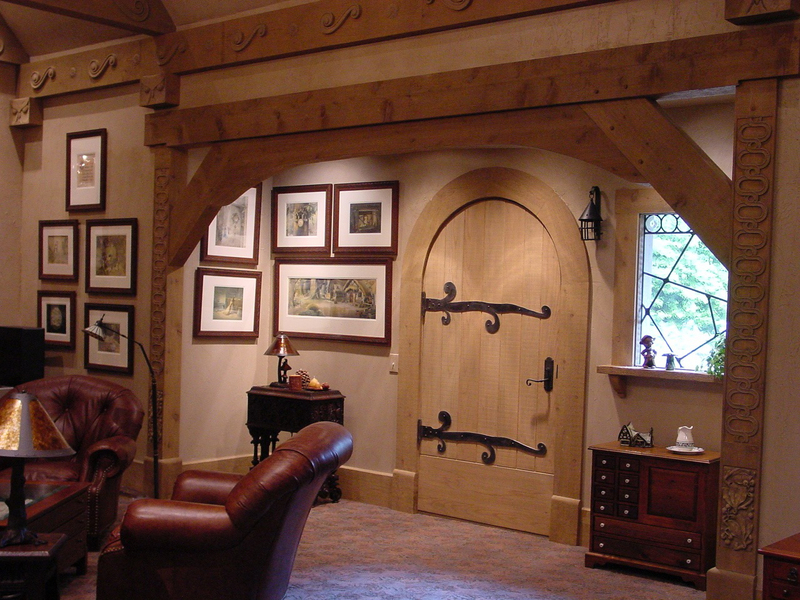 I actually did this three times over a 20 plus year time span, but finally decided my Snow White days should/would come to an end when I retired and built a home in the mountains of North Carolina...not a location conducive to “home galleries”. That was about the time I was approached by Disney Feature Films to see if I’d be interested in letting Snow White come back home to where she started. Today, my collection is under the watchful and protective eye of The Disney Animation Research Library in Los Angeles. A decision I’ve never regretted. 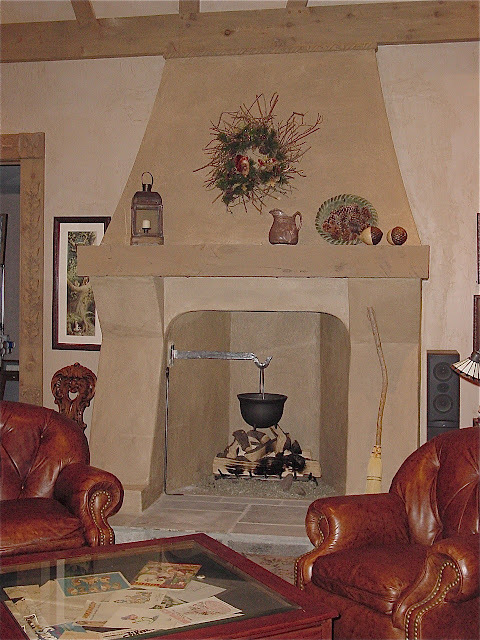 Home Gallery images courtesy of Stephen Ison. FL: Has your "hobby" of collecting Snow White cels opened doors for you? That is, have you met many other SW collectors? Other people associated with the making of the film or other later Disney personalities? Any anecdotal stories you'd like to share? SI: Yes, many wonderful doors have opened, as a result of collecting from Snow White...exhibitions throughout the world, books, lectures, lifetime friendships... One of my favorite memories is the night I received a phone call from a woman who said her name was Diane Disney Miller, that she had read the forward of my Snow White book and it made her cry. She then asked if she could come to my exhibit at the Indianapolis Museum of Art...that person, of course, was Walt Disney’s daughter, Diane. She has always been so supportive. What an honor. That was the ultimate for me at the time. Recently, Diane asked me to curate an exhibit of Snow White animation art for the Walt Disney Family Museum in San Francisco. A must see. An amazing facility and tribute to her father. It opens December 2012 in celebration of the 75th anniversary of the release of Snow White. We’re pulling Snow White art from every source I’ve ever known for the last 25 years. It will be an extensive exhibit. FL: Have you seen other Snow White collections? When you're with other similar collectors, what's the conversation like? 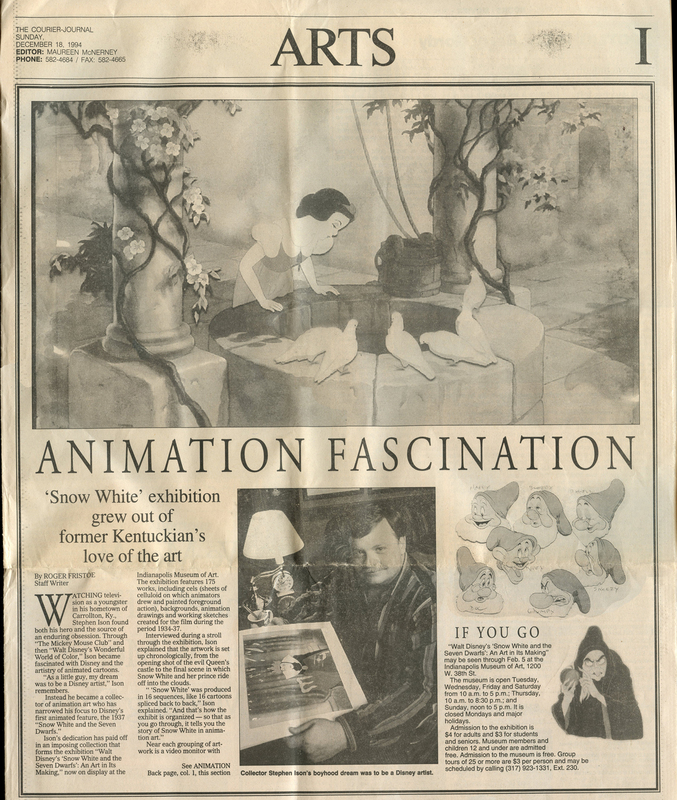 SI: As far as I know, there are, nor ever were, any serious collectors of “Snow White only” animation art. Most of the high-end collectors had art from all of the classic Disney films. That was always tough for me, and at times, took a lot of discipline for me not to do the same. I really loved it all. FL: Are you collecting today? SI: Well, once bitten, as they say. Yes, I’m still picking up choice pieces, but not just from one film. I especially enjoy concept art from Fantasia. Some of those pieces are amazing and are truly works of art. The Walt Disney's Snow White and the Seven Dwarfs: An Art in Its Making exhibition ran for two months at the Indianapolis Museum of Art, from December 4, 1994 until February 5, 1995. 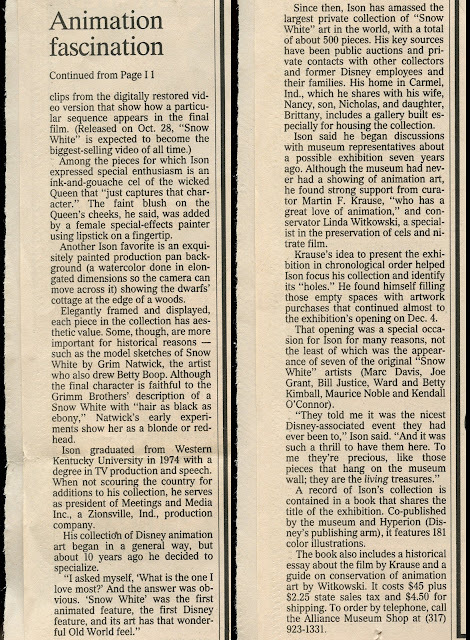 A newspaper article dated December 18, 1994 in the Louisville Courier-Journal highlights Steve and his museum exhibit. Newspaper images courtesy of the Dan Alexander Collection. Used with permission. 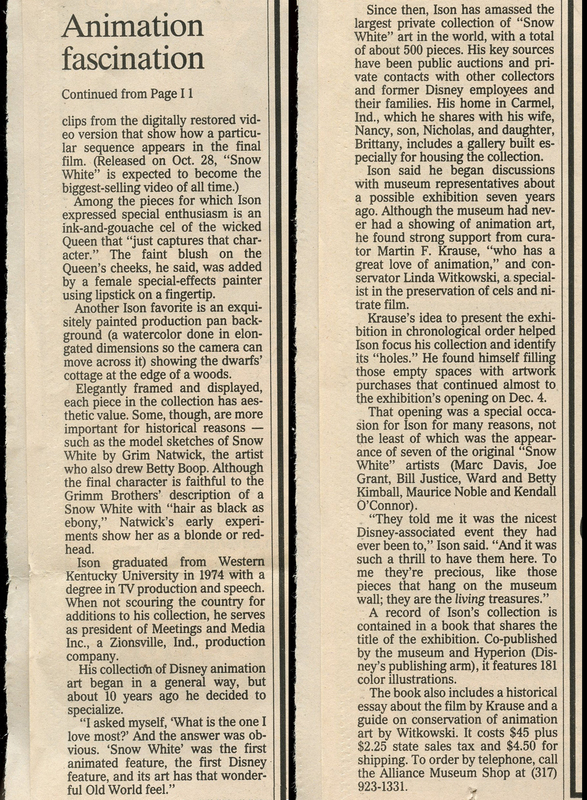 Read Dan's Dizmentia post about his 1994 visit to this Snow White exhibit. 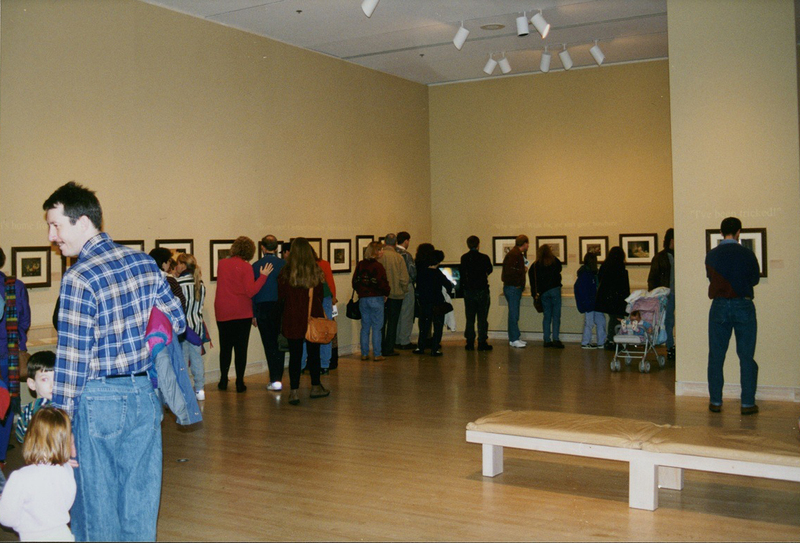 Exhibit images courtesy of Stephen Ison. FL: How did the An Art in Its Making exhibit come about at the Indianapolis Museum of Art? SI: It took me about four years to convince the Indianapolis Museum of Art to sponsor an exhibit of art from Snow White. Many people at the museum didn’t consider it art. In the end, it broke all attendance records for the museum’s 150 year history! Take that nay sayers! FL: Was it your entire Snow White collection? SI: Yes. However, after the exhibition, my collection almost tripled in size over the next 12 years. FL: Did you attend the opening? SI: Yes. 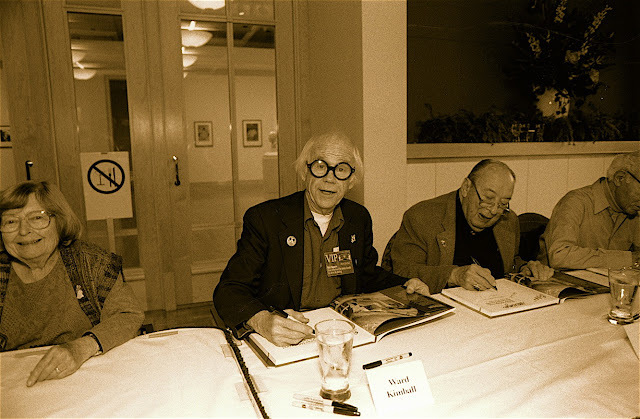 We also flew out several of the original artists who worked on Snow White...Joe Grant, Marc Davis, Ken O’Connor, Ward Kimball, Betty Kimball, Maurice Noble, and Bill Justice. Great weekend. People lined up for hours to meet them and have books signed. 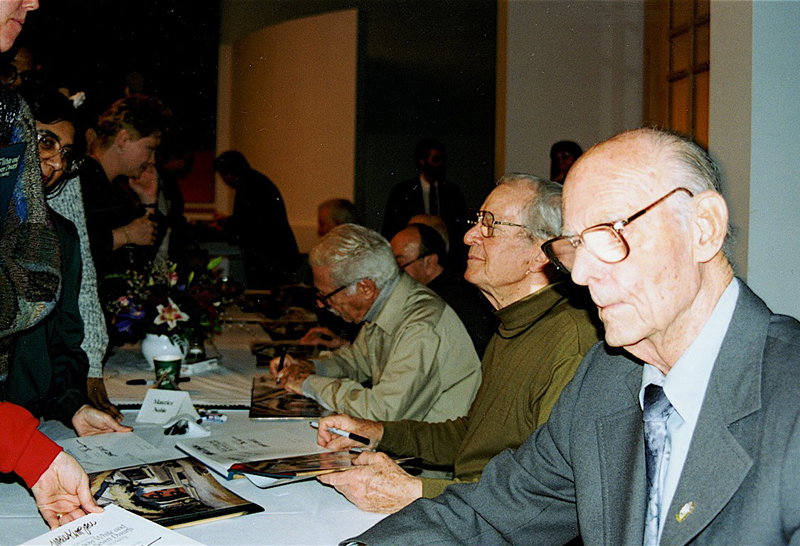 Book Signing images courtesy of Stephen Ison. FL: Finally, any special memory or anecdote from the event? SI: To see these people honored in this way was one of the most satisfying events I’ve ever witnessed. And, to see so many people respond to these wonderful pieces of art was the true pay off of years of collecting. Also, personally touring groups of young school children and watching them react as they learned and asked “real” questions. 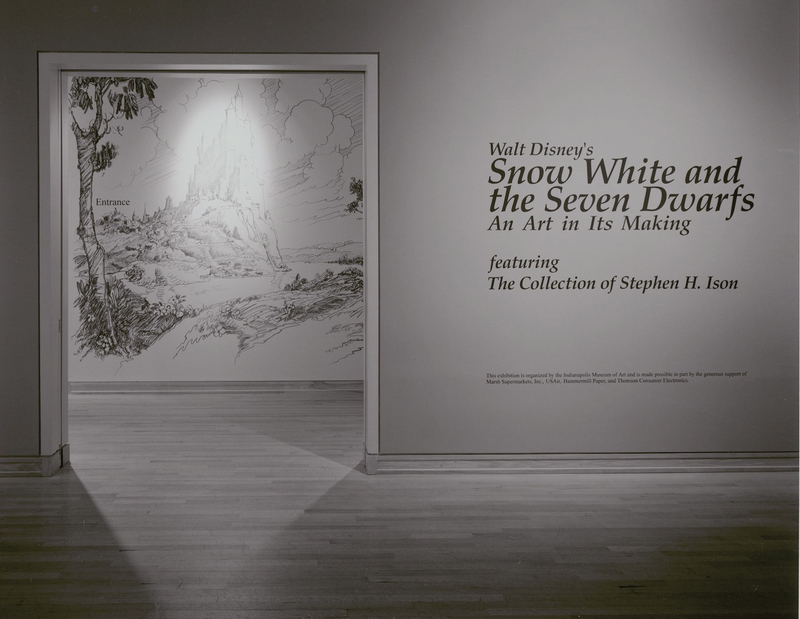 I, for one, can't wait to see the Snow White art exhibit Steve is assisting with for the Walt Disney Family Museum. Hopefully we'll get more details on it as we get closer to its opening in December 2012. In the upcoming posts, we'll have a look at the 1994 book featuring Steve's collection as well as the guide booklet from the IMA exhibit. I consider myself as a Snow White collector too, but collecting original cels and drawing which are the essence of the movie, is being part of the history. I have heard about Steve Ison before. So, I certainly saw one of his collectibles art at this expo. Then, I've got a giant book about Snow White from "Pierre Lambert", with many cels print in it. The name of Stephen Ison appear at many times in this book. This is a really interesting post. 74th Anniversary of Disney's Snow White! Coming Soon! The Carthay Circle to DCA!